"Can't you come out with it just once? Say what's on your mind!" The punnishly-titled Billy's Holiday concerns the adventures of one Billy Apples (Max Cullen), a hardware store owner who spends his evenings as the devoted but mediocre lead singer for the "Billy Apples Band" at a local pub. Years ago, Billy had a brief career in the music biz partnered with his ex-wife Louise (Tina Bursill), interrupted by a bitter divorce that pushed Billy into a mundane existence of broken dreams and present obligations, including the raising of his daughter Casey Appleby (Rachael Coopes). Billy's luck begins to take a turn after an encounter with a shooting star—when he showers the next morning, he finds himself singing exactly like... Billie Holiday?!? Australian director Richard Wherrett's fantasy works on a couple of levels, mixing surprising, gender-bending comedy with a down-to-earth story of human frailties, desires and values. The central gag quickly grows old, but the story as a whole doesn't depend heavily on the premise; Billy's "channeling" experience is a gateway, not an end, enabling him to find his own voice in a world he thought he had left behind. Unexpected events serve to change Billy's life in profound ways, but there's no gimmickry of the sort that tends to infest Robin Williams' recent work; this is a credible fantasy built on metaphor, rather than magic. Billy's new life allows him to fight his way out of the emotional walls he has put up, and his transformation as a person never seems artificial, regardless of the means. Max Cullen gives an amazing vocal performance as Billy—I was flabbergasted to learn that most of his character's "Billie Holiday" singing is genuine, not lip-synched to old recordings or otherwise rigged in post-production. Young Rachael Coopes is intelligent and radiant as daughter Casey, Tina Bursill is appropriately over-the-top as Billy's pushy ex-wife Louise and Kris McQuade is mature and understanding as Billy's current girlfriend. The members of the Billy Apples Band provide comic relief as good-natured blue-collar blokes, especially Drew Forsythe as Sid Banks. All of the characters seem genuine onscreen and support the script's human heart with skill and commitment. Billy's Holiday also benefits from great music and some lavishly-produced musical numbers, styled as a hybrid of 1920s' music and 1950s' presentation. Some of these are fantasy sequences illustrating Billy's relationships with friends and family, and all are quite entertaining, full of color and subtly sophisticated camerawork. It is these sequences that give the film its considerable energy, transforming it from a well-produced but average little comedy into something more profound. 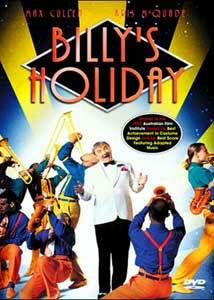 Director Wherrett understands that music captures the human soul in ways words cannot, and Billy's Holiday takes full advantage of the insight. Lady Day would be proud. Image Transfer Review: Anchor Bay presents Billy's Holiday in its original theatrical 1.85:1 widescreen aspect ratio, with a fine anamorphic transfer. The source print is clean with just a few flecks here and there, detail is solid and color is excellent, rich and saturated in the big production numbers, natural in the real-life sequences. Once again, Anchor Bay puts certain of the majors to shame with an excellent transfer of this relatively obscure Miramax release. Audio Transfer Review: Billy's Holiday was released to theatres in the rarely-used Dolby Digital Stereo format, basically an all-digital version of classic Dolby Stereo Surround. The DVD preserves the digital theatrical soundtrack in Dolby Digital 2.0, with some nice front-stage pans, occasional surround effects and high-quality music, with significant low-frequency activity in a few musical sequences. Centered dialogue is occasionally obscured slightly by the matrixed audio approach, and one use of a vintage recording suffers from audible hiss, but the DVD represents the theatrical release accurately, and this is certainly one of the cleanest DD 2.0 tracks I've heard. Extras Review: Not much to report here, just 23 text-menu chapter stops and the film's theatrical trailer, presented in 1.85:1 anamorphic but looking significantly softer, grainier and darker than the main attraction. The trailer also suffers from odd cropping, as though a full-frame image was created using a pan & scan approach, then matted off for theatrical exhibition in 1.85. Billy's Holiday is a fluffy little comedy about self-esteem that's well worth a look, presented with a fine DVD transfer by Anchor Bay. "What a night, what a moon, what a boy!"